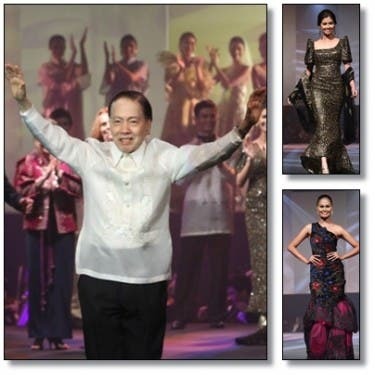 In the recent Metrowear tribute show, the Fashion Czar of Asia, Pitoy Moreno, has once again proven his tenure in the fashion industry with over 100 pieces that encapsulated his exquisite collection. Lifestyle Network (SkyCable Channel 52), the country’s premier lifestyle channel, takes pride in airing this historic show dubbed as “Jose Pitoy Moreno: A Tribute Gala” on January 23, 12p.m., January 25, 11p.m. and January 28, 10a.m. The special tribute presentation was accompanied by performances from Rico Blanco, Rem Zamora, and Gary Valenciano, accompanied by the Manila Symphony Orchestra that played Filipino tunes with an ethnic touch to complement the presentation. Hosted by KC Concepcion, the show also featured a stunning collection that sums up Moreno’s illustrious career donned by celebrity models including Marina Benipayo, Phoemela Baranda, 2010 Ms. Universe 4th runner-up Venus Raj, 2011 Ms. Universe 3rd runner-up Shamcey Supsup, Sam Milby, Piolo Pascual, Megan Young, Lauren Young, Denise Laurel and Karylle.